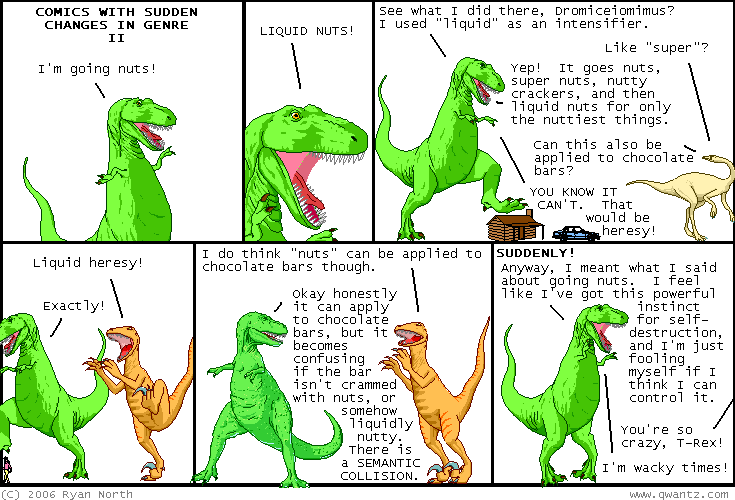 Dinosaur Comics - November 21st, 2006 - awesome fun times! –I would also like not to die, please! November 21st, 2006: I'm going to try having some Project Wonderful ads under the comic for a bit. The launch of Project Wonderful has gone well, and it's really gratifying to see how welcomed it's been. I never thought of having a bar of ads beneath the comic when we launched Project Wonderful, but other sites like Goats, Diesel Sweeties and The Creatures In My Head have had good times with them! It's really neat to see how PW is being used in ways like this. Right now bidding is cheap (as in free), so give them a try! One year ago today: flavoured chips! !